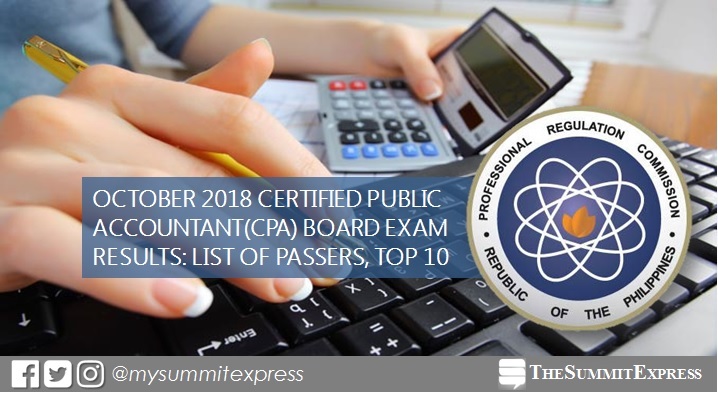 MANILA, Philippines – The October 2018 Certified Public Accountant (CPA) board exam results including the official list of passers from more than 10,000 takers, topnotchers (top 10), top performing schools and performance of schools are released online today, October 22, 2018 or in six (6) working days after the last day of exam. As announced, 3,616 out of 14,358 passed the exams. The results of examination with respect to three (3) examinees were withheld pending final determination of their liabilities under the rules and regulations governing licensure examination. The Professional Regulation Commission (PRC) conducted the CPA licensure exam in the cities of Manila, Baguio, Cagayan de Oro, Cebu, Davao, Iloilo, Legaspi, Lucena, Tacloban and Tuguegarao on October 6,7 and 13, 2018. From October 29 to November 13, 2018, registration for the issuance of Professional Identification Card (ID) and Certificate of Registration will be done on-line. Please go to www.prc.gov.ph and follow instructions for initial registration. The date and venue for the oathtaking ceremony of the new successful examinees in the said examination WILL BE ANNOUNCED LATER, PRC added. CPA board exam's verification of ratings (passers, non-passers and removal) can be done online. NOTES: The Board of Accountancy has decided that the CPA Examinations shall cover the new and old provisions of certain laws and standards for the October 2018 CPA Licensure Examinations and thereafter. These include the Tax Reform for Acceleration and Inclusion or TRAIN Law, PFRS 9 on" "Financial instruments," and PFRS 15 on "Revenue from Contracts with Customers." "The reason for requiring knowledge of examinees on these is that the passers of the CPA examinations will be encountering situations that require knowledge thereof when they begin their careers as CPAs in the future," explained BoA Chairman Joel Tan-Torres. According to PRC Resolution No. 2017-1068, the target release of results for the recent CPA board exam is on Monday, October 22 or in six (6) working days after the test. In the same period last year, CPA board exam results were announced in ten (10) working days, delayed due to the cancellation of government office work. A total of 4,511 out of 14,816 (30.45%) successfully hurdled the grueling exams. Alfonso Solomon Ramos Magno from University of Santo Tomas (UST) topped the board with 91.33%. It was followed by Judy Ann Malate Tuzon, University of the East (UE) - Manila alumna with 91.17%. In the October 2016 exams, results were out in eight (8) working days. PRC named 5,249 out of 14,390 who passed the exams. Vhinson Jay Samson Garcia from Wesleyan University - Philippines - Cabanatuan City aced the board with 94.33. It was followed by Southern Luzon State University (SLSU) - Lucban alum Daryl John Sarmiento Punzalan ranked second with close rating of 94.17%. Meanwhile, results may be released online ahead or beyond the schedule without prior notice. We advise takers to monitor announcement of results starting this week. Monitor this page for the real-time updates on Accountancy board exam results. Check out also the official website of PRC for more information.